Sonic the Hedgehog 55 is the fifty-fifth issue of the Sonic the Hedgehog comic. This comic features two stories: "Monkey Madness" and "Rise of the Robians". Sonic the Hedgehog, carrying Sally Acorn through a forest, dashes along to investigate a number of Eggbots that have appeared in the area. Slacking behind is Antoine, who asks Sonic to slow down so he can catch up. Sonic, wanting to get out and investigate the Eggbots, tells Antoine to get moving, speeding even further ahead of him. Sally jokes that perhaps Sonic should slow down, but Sonic, always interested in danger, won't take the advice. They arrive in a clearing and hide behind some large stones. They look out from the stones and see a group of Eggbots guarding a large drilling device. Sonic devises a plan to take them out, but wants to do it with stealth. Before he can start, Antoine appears, speaking loudly about how Sonic waited for him. Sonic runs up and covers Antoine's mouth, telling him to keep it quiet. He joins the two as they overlook the Eggbots' work, while Sally takes out NICOLE to determine where they came from. She walks back to the forest and finds a large mechanical crypt hiding in the bushes where an energy signature is emanating from. On the other hand, Antoine and Sonic argue over bravery and idiocy, as Sonic wants to just hop in and take the bots out. The Eggbots, meanwhile, have begun their drilling efforts, with Snively relaying orders from his cell in the Devil's Gulag through a communicator in his thumb. The Eggbots notify him that the atom driller has penetrated the outer crust. They look inside the opening and locate a Power Ring. They proceed to remove the ring, but Snively interrupts them, saying he didn't want a Power Ring, but rather, to locate Ixis Naugus' power signature. Before they can react, the Power Ring floats out of the fissure and flies over Sonic's head to Monkey Khan, who stands over the valley on a cliff edge. The ring lands on Monkey Khan's head, taking the form of a crown, which heightens his strength and senses. He yells out in joy as he jumps on a floating cloud and descends on the mining site, proclaiming his strength and that destruction is coming. Monkey Khan's actions are quickly noted by the Eggbots. They take aim and try to take him down with laser fire, but his movement is too quick for them. He jumps into the fray and easily takes out some of the bots, followed by their atom driller. The remaining Eggbots flee the area, while Snively contemplates the situation, calling in a second wave of Eggbots. Meanwhile, Sally, having returned to the group, explains to Antoine and Sonic that Monkey Khan was a creation of Robotnik. Before she can explain anything further, Sonic doesn't question anything and hops into action to stop Monkey Khan before he can do anything else, against Sally's objections. He spindashes into Monkey Khan, knocking him for a loop. Monkey Khan, meanwhile, tries to retaliate, but can't do anything with Sonic's super speed. Sally continues to object, yelling out to Sonic that Monkey Khan had rebelled against Robotnik and is not an enemy. This gets Monkey's attention, making him realize how beautiful Sally is. He dashes down and grabs Sally, taking her away to be with her and to bask in her beauty. Sonic looks over to Antoine, wondering what they should do now. Instead of coming up with a plan to save Sally, Antoine says that Sonic should admit that he is at fault for not listening to Sally and starting the mess. Sonic ignores Antoine, grabbing his coat and dashes off to catch up with Monkey Khan and Sally. They don't get too far until they are ambushed by Snively's second Eggbot wave. Sonic jumps at some of the Eggbots, saying how he has his own means of diplomacy with his fists, while Antoine uses his sword, although nervously, to disarm another Eggbot. Sonic drop-kicks the last Eggbot right over Antoine, as Antoine complains that Sonic's solution to everything is violence. He goes on to insult Sonic even more, but stops him before he takes a back step off a cliff. Unfortunately for them, more Eggbots arrive, just as both stand at the precipice of the cliff. Back in the sky, Monkey Khan tries to impress Sally by recalling the victory over the Eggbots, but Sally thinks otherwise, poking fun at him that kidnapping a girl takes real bravery. He asks if she's poking fun at him, while she states that he could be a true hero if his ego didn't get in his way. Meanwhile, back at the cliff, Sonic comes up with a plan to deal with the Eggbots. He takes Antoine's sword and digs it into the ground, releasing part of the cliff and sending some of the Eggbots falling. That only deals with a few Eggbots, as the rest continue to gang up on the duo. Just as Sonic wishes for back-up, Monkey Khan arrives on the scene, bringing with him a thunderstorm and shocks the Eggbots. Sonic follows up by kicking the bots off the side of the cliff. Snively, in his cell, now realizes that every single one of his Eggbots has been destroyed. Sonic thanks Monkey Khan, as Sally is let go and steps on the ground from Monkey's floating cloud. Sally's speech cleared Monkey's mind, and that he shouldn't have acted in his own self-interest. He even notes that he and Sonic are quite similar in that mindset. 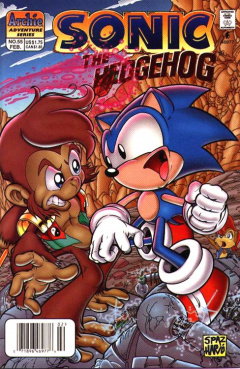 Sonic and Monkey Khan shake hands, realizing they can make a great team against any bad guy they face. With that said, Monkey Khan flies off into the sky, now able to enjoy the freedom he has been denied for 10 years. In Mobotropolis, a large group of Mobians, wielding torches, surround a Robian peacock. She tells them to stay back, but they won't listen to her, having caught her snooping around one of Robotnik's old labs. Suddenly, a large flash of light appears in the sky, blinding all the Mobians. Uncle Chuck appears and goes over to the peacock, who introduces herself as Fanny Dupin. He reveals that he has some photon-flash pellets that can help them escape. The mob come to and see Uncle Chuck. One of the Mobians, Tusk Luza, accuses the Robians of working together no matter the situation. Uncle Chuck tries to take command of the situation, asking what Fanny did to cause such an issue. Tusk calls out to Fanny, asking her to admit that she was snooping in an area that has been cordoned off from everybody. She admits that she did, but only as a dare from a friend. Uncle Chuck walks over to Tusk and tries to calm him down, but the explanation isn't enough for him. Tusk asks to take this issue to Sally, which Uncle Chuck agrees to. The two quarrelling parties arrive at Robotnik's old headquarters, now the royal Castle Acorn, where they wait in Robotnik's old throne room for Sally to arrive. Geoffrey St. John hears the commotion of the two groups and arrives to calm them down, threatening to kick them out if they continue to cause any issues. Uncle Chuck explains the situation, but Geoffrey can't help, as Sally is off with Sonic dealing with the Eggbots. However, the door to the throneroom opens, revealing the still half-crystallized King Acorn who, despite his medical state, declares that he is still the King of the city. Geoffrey helps the King into Robotnik's old chair and announces that he has already come up with a decision to the quarrel, having overheard it all that time. He declares that all Robians will be dismantled treason, starting with Fanny. This decision comes to a shock to everybody, even the Mobians. While Fanny cries over the situation, Uncle Chuck objects, noting that the King can't pass a law on the spot and create a sentencing at the same time, in that it is unfair. The King turns the tide on Uncle Chuck, noting that it was him who gave Robotnik the means to overthrow the kingdom, and thus, shouldn't have any word on what is unfair. He takes the sentencing a step further, ordering that both Uncle Chuck and Fanny should be dismantled immediately. Even Geoffrey is questioning of this, asking the King to reconsider his decision. The King disagrees, whacking Geoffrey aside with his cane. Meanwhile, Sally, Sonic and Antoine walk into the throneroom, unaware of any of the actions that had recently occurred. Sally looks on in shock as her dad steps off the throne and yells out, wondering why everybody is questioning his orders. A sudden pain appears in his head, knocking him out cold. One of his guards quickly arrives and stops him from falling over, while Sally calls out for somebody to get Doctor Quack. Even with all these troubles, another issue comes up as Knuckles appears on a monitor in the room, asking for the Freedom Fighters' help on the Floating Island. Sonic looks over at the reader, noting that it's one of those days that you don't want to get out of bed. Continued in Knuckles the Echidna 9 and issue 56. This issue features the first appearance of Monkey Khan. This is the first issue to be written and drawn by Frank Strom. Tails and Uncle Chuck are not with Sonic at the start of issue 55. Antoine and Sally are with Sonic at the start of issue 55, which was not the case in issue 54. Snively's Eggbots located Sonic and his gang at the end of issue 54, but are not aware of him in issue 55, working in another area.